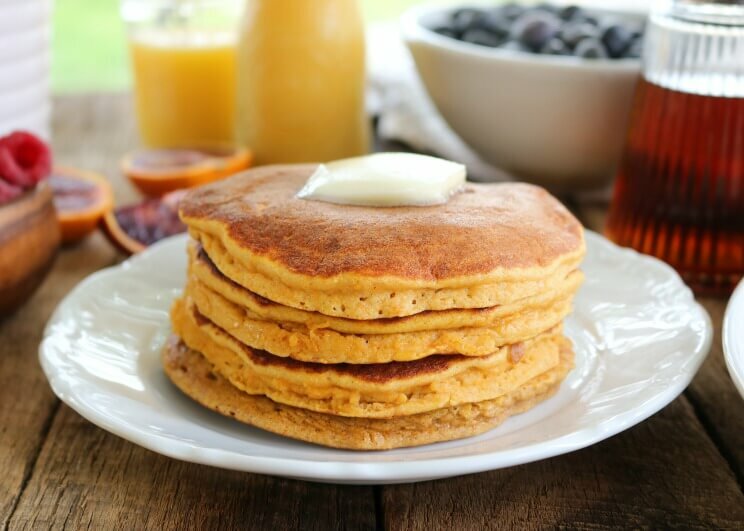 Fluffy and spiced, these sweet potato pancakes are just waiting to be smothered in grass-fed butter and maple syrup! The perfect pancake is fluffy and moist, ready to be piled high and devoured. 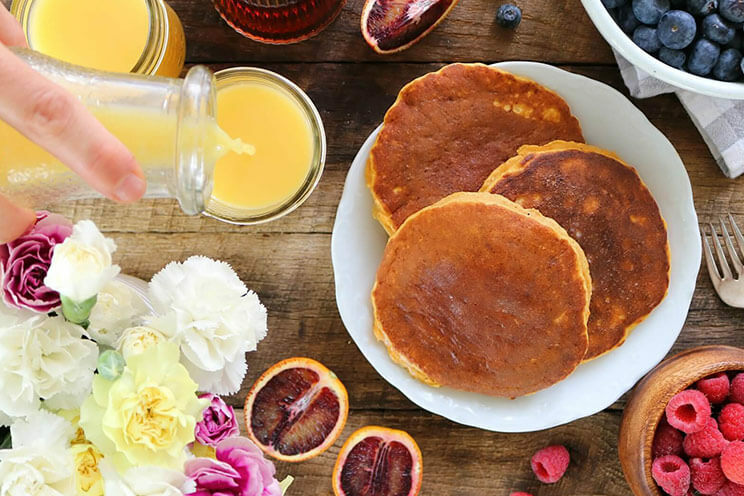 For this Paleo recipe, mashed sweet potato is the secret to making perfectly gluten-free pancakes. Sweet potatoes provide a boost of fiber while keeping the batter thick and moist. For the base of the batter, the mashed sweet potato combines with almond flour and eggs. Almond flour is a great sub for traditional flour in Paleo recipes. It doesn’t soak up moisture the way that coconut flour does, so there is no need to add milk. If you can’t use nut flours, substitute arrowroot powder instead. A little bit of cinnamonpairs perfectly with the flavor of the sweet potato, creating a cozy, spiced aroma. Start by peeling and boiling 1 small sweet potato until soft and mushy, about 15 minutes. Skin and mash the potato until smooth. Lightly beat eggs and add in sweet potato, almond flour, baking powder and cinnamon. Continue to mix with the fork until smooth and well combined. Heat a large skillet over medium heat and melt down grass-fed butter or ghee. Use a ⅓ cup scoop and pour batter onto hot skillet. Allow pancakes to cook 3 minutes on each side and then carefully flip. As a rule of thumb, pancakes are usually ready to flip when bubbles form on top and pop. Serve warm with plenty of grass-fed butter and maple syrup with a Golden Turmeric Latte to wash it down! Heat a large skillet over medium heat. Melt 1 teaspoon of butter. Scoop 1/3 cup of pancake batter and pour into skillet. Cook 2-3 minutes. Use a spatula to flip and cook an additional 3 minutes. Serve hot with extra butter and maple syrup.